Open can of black beans, place in strainer and rince off excess “juice”. dump in bowl. I bring this to every potluck, and everyone LOVES it. It can be eaten as a “salad” like cole slaw, or with corn chips. 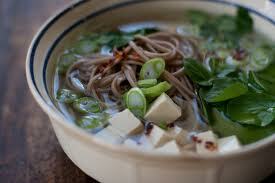 Miso soup is a traditional Japanese soup that is very delicious and ultra-low in calories. With simple ingredients and barely any preparation, you can this meal out together in to time! Add miso, ginger, and dulse to 1 cup of boiling water. If you love Mac & Cheese but have trouble controlling your portions… this is the solution for you! Making mac & cheese in a muffin pan will limit you to eating less while still enjoying this favorite comfort dish. Read more for the recipe! 1. Pre-heat the oven to 400. Lightly mist a 12-cup muffin tin with cooking spray and set aside. 2. In a small sauce pot, melt the butter over medium heat. Add the flour, mixing it into the butter until thick. Stir in the milk and garlic and raise the temp to bring the mixture to just under a boil. Add the cheese and whisk mixture together until thoroughly combined into a cheese sauce. 3. Remove the cheese sauce from heat and then mix in the egg and egg white (binding agents) until combined. 4. In a large bowl, combine the pasta, spinach, cheese sauce, salt and pepper and mix together. Spoon the mixture evenly into the cups of your prepared muffin tin. 5. Bake for 10-15 minutes until the tops slightly brown. Let cool 5 minutes before removing from muffin tin. This super simple snack is so delicious, all you have to do is chop- and pop em in! Chop a baby cucumber, add lemon juice, olive oil, salt, pepper, a little chile powder and your golden! It’s as easy as that… enjoy! Posted in Healthy Recipes, Snacks. Bookmark the permalink. Here is a good idea for breakfast or snack! Mix it all up into a coffee mug! Put it in the microwave for 1 minute, make sure it doesn’t overflow! Add an extra 30 sec if it needs to firm up. Posted in Breakfast, Healthy Recipes, Snacks. Bookmark the permalink.